New Zealand is an epic place to explore, I totally fall in love with the rolling mountains, sprawling lakes and friendly locals every time I visit the land of the long white cloud – there’s something about those two islands that keep drawing me back for more! A few years ago I had a good bounce around the south island and was stoked with how much there is to see and do, but unfortunately I totally neglected the north! So despite spending the bulk of my last trip there surfing and chilling in Raglan (an amazing little surf town on the west coast of the north island) I also took the opportunity to explore some more of what the north has to offer and teamed up with the guys from Kiwi Experience, both to explore some more and find out why these buses are one of the most popular travel options in New Zealand. My Ride For The Trip! As with most places on the backpacker trail New Zealand comes with plenty of options when it comes to transport. 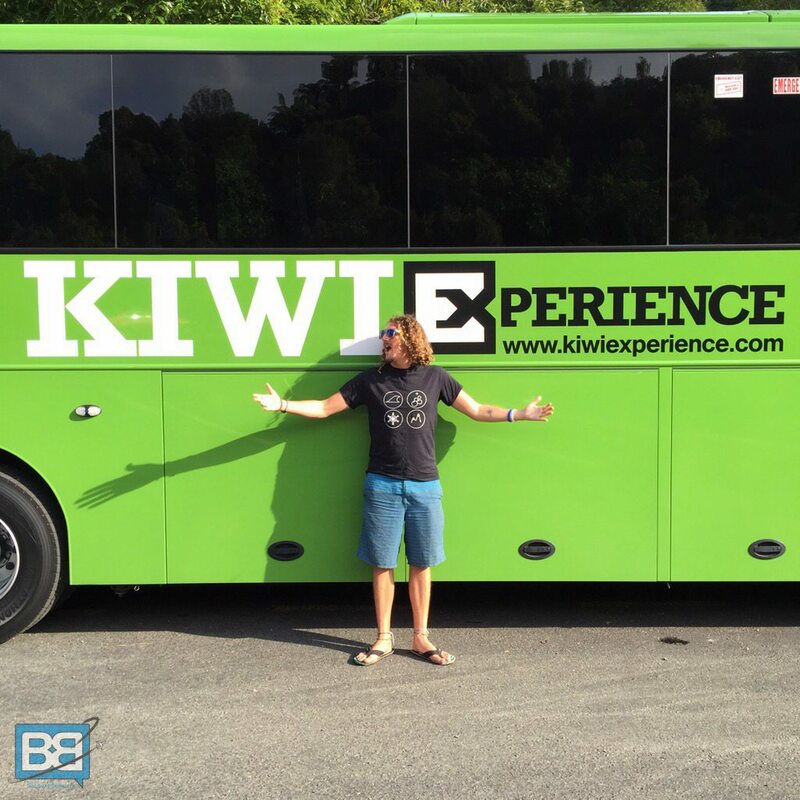 The Kiwi Experience has been running for over 25 years now so it’s safe to say they know what they’re doing! One of the biggest draws is the fact they offer a flexible hop on, hop off bus service that allows travellers to do just that – with up to a year to complete your pass there’s plenty of time to explore each stop off. This flexibility and time frame means it fits people on fixed time frames and open dated trips as well as working holiday visas. If you like a place heaps, simply stick around a bit longer. Not so keen? No worries, it’s easy to change your bus departure to an earlier one…although keep in mind in peak season buses can fill up pretty quickly so the more advance notice you have the better! Despite the 12 month validity many people on the Kiwi Experience stick with the minimum travel times, which vary from a few days to a month, depending on the pass you’re on. Clean, Comfortable and Bright Green! On one hand this creates a great group dynamic where you effectively travel with a heap of new buddies and share the whole experience with them. Personally though if you have more time to play with then make the most of it and extend some stops as I found the minimum travel time pretty rushed in some stops. 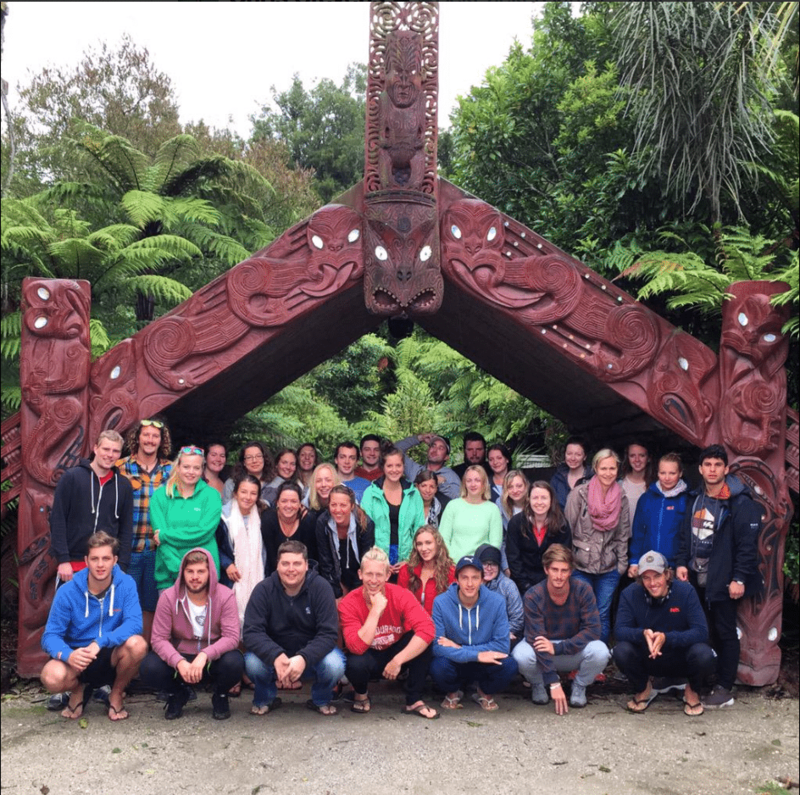 Take Rotorua for instance – the Kiwi Experience has a one night stop over there and if you opt for the Maori Homestay you don’t even make it into the town! 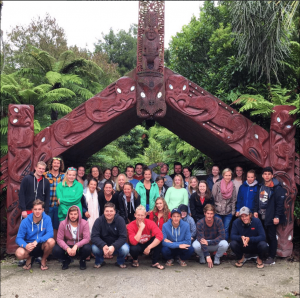 I on the other hand ended up spending 4 days here and packed out every day with something epic; white water rafting, zorbing, the Maori homestay and even an afternoon at Agroventures – things I would never have experienced if I’d stuck with the group. I guess that comes down to how you like to travel though and how much time you have to spare – so do some research on each stop before you lock in your time frame and make the most of everywhere you’re passing through. Although the Kiwi Experience has a pretty open policy on age ranges (there were even people in their late 30s on some of my buses!) from what I saw on the few buses I joined there was a pretty big leaning towards the 18-22 demographic of younger travellers on their gap years and RTW trips. Even though a lot were Brits there was a good mix of nationalities, which is always welcome! With this came a pretty big party vibe and most nights were spent with a few beers enjoying the local nightlife. For many that would be no issue – but if you’re looking for a slightly more relaxed and chilled atmosphere or are at the higher end of your 20s then it might not be the right fit for you. Still, age is just a mentality and I got on heaps well with most people on my trip (I’m 27 incase you were wondering!) so it really boils down to how you personally want to travel and what kinda of traveller you are! What you can be guaranteed though is that you’ll have an epic time and if you don’t like the people on your bus, you can simply hop off for an extra night and jump onto another…problem solved!hahaha! With limited time on my hands I opted for the Lakes and Geysers Pass, which covers Auckland, Hot Water Beach, Waitomo, Rotorua and Taupo before looping back to Auckland again. 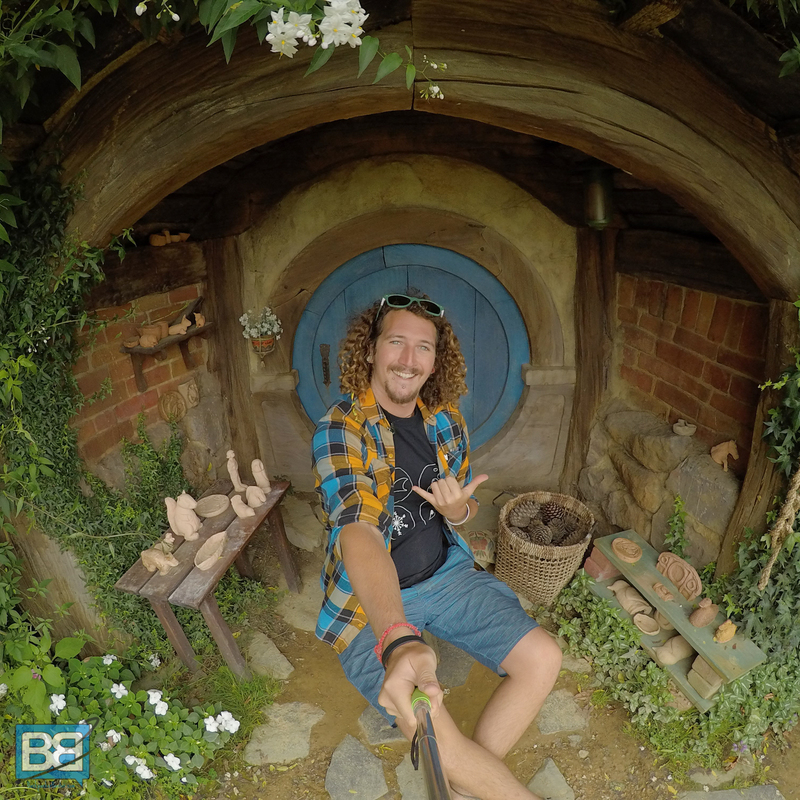 Hobbiton – One Of The Many Stops Along The Way! 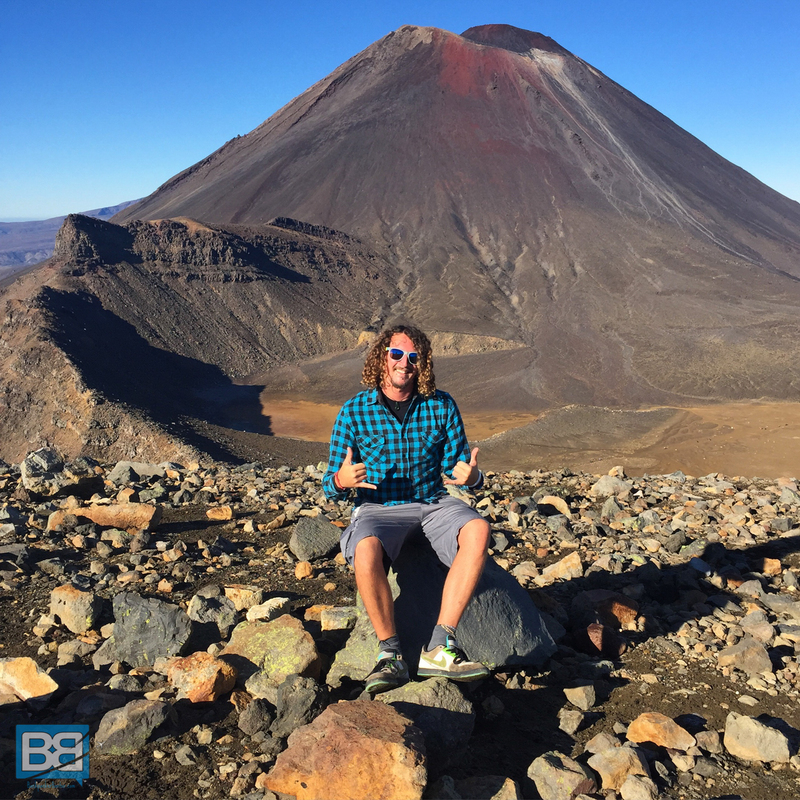 For me it was the perfect option for cramming in heaps of North Island goodness and there was more than enough en route to keep me busy – from white water rafting to hiking the Tongariro Crossing, zorbing (sorry I mean sphering!) to visiting Hobbiton! But the Kiwi Experience isn’t just the north Island – there’s plenty of pass option to fit all time scales, routes and of course budgets. Whether you go all out with the Whole Kit And Caboodle which takes in everything on both islands, start in Auckland and finish in Christchurch, just take in the north island or stick to the south there’s something to suit. If you visit the South Island too expect things like swimming with dolphins, hiking glaciers, eating the famous Fergburger, bungee jumping and skydiving to be on the cards too! In fact across the 2 islands there’s 20 overnight stops and heaps of other optional ones to add in too, so there’s plenty to keep you busy whatever your plans and route. Which pass you choose is a pretty personal choice but there’s also heaps of special offers going on so keep an eye out for some heavily discounted passes and nab yourself a bargain! As with everything travel getting value for money is always a big priority and overland travel is no exception. If you’re travelling solo then the Kiwi Experience is a solid call when it comes down to value for money – you can cover a lot of ground much easier and cheaper than public transport or renting a van. If however you’re travelling as a group it becomes a bit more tricky as camper vans and cars come into play. That being said though the Kiwi Experience bus passes mean you don’t have to worry about fuel, navigating and all those other things that come with other ways to get around! With the Whole Kit and Caboodle RRP at $2032NZD (about £1,000) it’s not a small amount of cash to part with, but if you break it down it works out great value for money – even more so if you grab it on sale! They also have some great monthly deal so keep an eye out for some bargains! Also keep in mind that when you’re travelling on the Kiwi Experience you also get heaps of awesome discounts on accommodation (they also guarantee your bed for the first night in every stop) and activities and if you’re planning on making the most of your time in New Zealand these will quickly mount up. So although it looks like you’re just paying for a bus pass it’s got lots of added value to it too. And of course with all the crazy activities New Zealand has to offer the Kiwi Experience guys will help showcase all the options available to you – in many stops I had no idea what I was going to do to fill my time but there’s always a good variety on offer. As you head between stop offs your guide will clue you up on what you can expect and they can also book your activities for you – allowing you to kick back and relax as well as making the most of your time in each place. If you want some more info on the activities on offer and budgeting for New Zealand here’s my New Zealand budget breakdown. 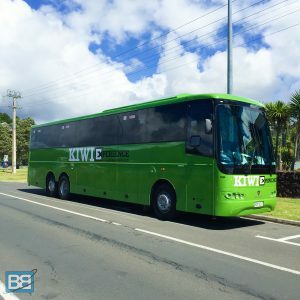 Although the Kiwi Experience is essentially a hop on, hop off bus service it packs way more than simply a bus from place to place. You’ll easily make heaps of new travel friends, save dollar on loads of activities and stop off en route to explore more of what New Zealand has to offer – whether that’s short hikes, scenic view points or even chilling with baby seals! The drivers aren’t simply there to put pedal to the metal, they’re an essential part of the experience too – providing loads of information, helping you book all your activities, getting some serious group bonding going on and they’re always a good laugh! I loved jumping on the Kiwi Experience for my North Island trip and I’d have no issues with using them again when I head back to explore even more of what New Zealand has to offer…something I plan on doing pretty soon. Admittedly yes it’s not going to suit everyone, but for those looking for an easy, value for money way to get around and meet heaps of like minded travellers it’s a solid choice. So if you’re heading that way check out their range of travel passes, there’s an option in there for most travel plans! Have you travelled on the Kiwi Experience? Which pass did you go with and how was it? Loved reading this. Brought back so many memories! I used the Kiwi Experience to travel around New Zealand a fair few years back now and it was one of the best decisions I ever made. I was travelling solo and was a young whipper snapper at the time, so it really was the perfect way to meet people and make connections with like minded travellers. Only negative (as you’ve touched upon) is that I made so many good mates, it deterred me from staying as long in some places as I wish I had. Just a good excuse to go back though aye ;). Great post! Great review, thanks! I am just planning my trip and thinking of doing the same route you did. One question I would love to know though, is if you did it all in the minimum time or did you allow extra days? I personally added some extra nights onto my North Island itinerary as there’s heaps to do in Rotorua and Taupo, but you’ll find a lot of people stick with the minimum itinerary, especially for the Whole Kit and Caboodle Pass. My advice though – if you have the time and money to stay longer, DO IT! Also let me know if you want me to hook you up with some discounts!